Warm weather requires lots of air conditioning, which results in high electricity bills. But there’s one energy-efficient option that will help you cut down the cost. Though often overlooked, a wall-mounted fan might just be the perfect option you have. Compared to air conditioning units, it has a much lower initial and running cost. What’s more, wall-mount fans are a real blessing when it comes to solving space dilemmas. But in order to get the most benefits, you need to ensure that you get the best wall mounted fans for the job. Wall-mounted fans come in different styles, designs, and sizes. The one you choose will largely depend on the amount of space that needs cooling. For instance, fans with large airflow are suited for large spaces. 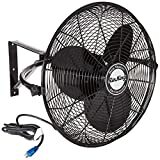 You might also want to consider the amount of noise generated by the fan, especially if you’re planning to use in a bedroom, library, or TV room. Now it’s time to look at the best wall-mounted fans you can choose from. This is a classic 65-watt wall-mounted fan. It sports 16-inch PPC blades driven by a 3-speed motor. At high speed of 1250 RPM, the fan generates 2118 CFM of airflow; a perfect capacity for a small sized room. The blades are protected in a steel mesh. The fan is designed to oscillate through 90 degrees for maximum coverage. It tilts 15 degrees up or down to direct the airflow where you need it most. There are two pull cords for oscillation and speed control. 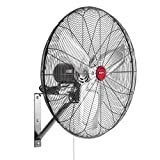 The fan has a durable steel neck for maximum support. It comes with a 60-inch cord to provide longer reach, especially when the power outlet is quite some distance away. This is an industrial grade wall-mounted fan; one that’s designed to provide long-lasting performance. The fan is powered by 1/6 hp motor. This variable speed motor is totally enclosed and is fitted with ball bearings for whisper-quiet operation. The motor is adjustable to 3-speed levels: Low (1050 RPM), Medium (1310 RPM), and High (1500 RPM). The fan generates a maximum airflow of 3670 RPM. At lowest speed, it has a noise level of 48 dB. The fan comes with a wall-mount bracket and a 9-foot power cord. 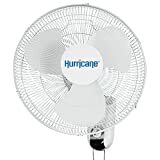 This is an upgrade of Hurricane classic wall-mounted fans. This fan is designed to push 30% more air. The fan is powered by a 75-watt motor and sport a 3-blade design made of tough ABS plastic. There are 3-speed levels to choose from, the highest being 1500 RPM. At this speed setting, the fan generates up to 2540 CFM. 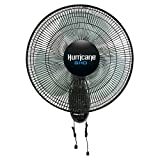 The fan sports a 90-degree oscillation and has an adjustable tilt for maximum coverage and airflow control. It’s protected in a rugged, metallic guard made of steel. You get a 6-foot power cord to provide extra-long reach. A little bit smaller than the traditional wall-mounted fans, this 12-inch fan makes a perfect choice for spaces that require less airflow. The fan runs on a 50-watt motor adjustable to 3 different speeds. It sports a 3-blade design and has a side to side oscillation of 180 degrees. You get a high-speed setting of 1450 RPM generating an airflow of up to 1410 CFM. The fan isn’t that loud and can even be left on while watching television. Simple directions and lightweight construction make it easy to install. The fan comes with a 5-foot power cord. 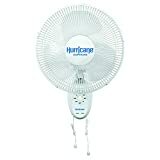 This is a versatile, durable fan designed for increased airflow. The fan is equipped with a powerful, energy-efficient motor. This fan ditches the traditional plastic blades for sturdy aluminium blades. The motor is adjustable to 3 different speeds and generates up to 6500 RPM in the high setting; a capacity that makes it ideal for large spaces, for instance, shop and garage. It has a side to side oscillation of 180 degrees to provide wider coverage. The fan comes with a 6-foot power cord.